The legendary logo in New Buffalo, Michigan. It is August already! How does this happen!? For me August is all about the beach and the sense of vacation - whether lake or ocean. We don't exactly have many of those in Colorado (land-locked state), so every time we're back in Chicago, I try to make a trip up to Michigan for a weekend. FYI - if you've never stopped at Redamak's in New Buffalo, MI, you're missing out! There is this happy place in me that is always activated deep down when I think of summers in Michigan. But there's an even happier place for me than any beach or cabin: Pennellwood Resort. My family and several close family friends went to Pennellwood for a week every summer for over 15 years... until it closed while I was in college. 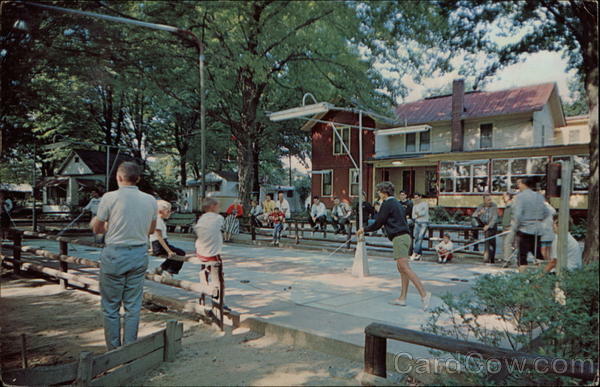 A photo from way, way back of the dining hall, horseshoes and shuffleboard tournaments. There was something absolutely magical about the Dirty Dancing-style resort in southern Michigan. It wasn't that it appealed to me when I was a kid; it was still one of my favorite places through high school, through college... I always looked forward to going to Pennellwood. I wanted to work there in the summer one day, like the waitresses I idolized. I loved the musty old cabins and the worn wood in the dining hall entrance, and how everything smelled like cedar. I loved the sound of the shuffleboard and ping pong table. I loved kayaking on the river or hiking in the creek in the woods. I wanted to have my wedding there, and when it closed, I didn't want to have a wedding at all anymore, because I could never have it at Pennellwood. It may sound crazy, but I love it to this day, even though the cabins have been torn down, the rec hall is gone, the dock is roped off and the pools are empty. Now, this may sound sad or crazy to some, but one of my deepest, utmost desires is to one day re-open Pennellwood - to make it once again the magical place that it was. This is a deep, constant desire of mine. No matter where I am, or what I want, or who I'm with, or what I'm doing... this desire remains in the back of my mind. I kept telling myself that it was childish for a long time, and tried to push it away... but with the transformation of myself that I've gone through over the past year, I've realized that what I loved about Pennellwood is totally worth sharing. It was the sense of community, the feeling of happiness from everyone there, the shared knowledge that we all loved this magical place so damn much that we cried every year at the last night's campfire when the staff sang, "I don't really wanna go home now." Most of all, I loved the feeling of freedom found there, with friends old and new. I want other people to feel that happiness that is brought by that little place in Michian. I want it so badly, that one day, I know it will happen. So this is my confession, another step in the process of manifesting a deep desire, is to say it outright to the world with emotion and faith that your words will become truth one day. I believe in my heart that this will come true, and I desire it enough that the How isn't important yet. What is your deepest passion today? What one desire is always in your mind?